Welcome back, Arrowheads! So we’ve had this whole Prometheus stuff hanging over this season, and now, it looks like Prometheus just launched another wave of pain against Oliver Queen. Besides leaking that hidden autopsy report on Billy to the police, our baddie also leaked it to the press, which could lead to the end of Ollie’s term as mayor of Star City! Also, Thea’s starting to remind Ollie of Mama Queen (and not in the best way, since Thea pretty much destroyed Susan’s career) and Felicity is really liking all that info she got from the mysterious Helix. And with that crazy Vigilante guy running around, things can only get worse. Questioning Sanity. In the flashback, Anatoly manages to avoid getting shot in the basement of the hospital by Gregor by calling for a vote by the Bratva for competency. That hearing only delays what is probably going to be Anatoly and Ollie being killed anyway, so Ollie takes the little time given before that meeting to tip the scales in their favor. So dressing up as The Hood, Ollie breaks into Gregor’s house to hack into his computer. From there, he brings evidence to Anatoly’s competency hearing, which show Gregor was siphoning money off of the deal with Kovar for himself. The result is a big shootout between those loyal to Anatoly and to Gregor. The Fall Guy. In the present, Ollie, Quentin, and Thea are at the mayor’s office, discussing what to do now that the buried autopsy report has gone public. Ollie tells Thea he wants her to patch up that mess she caused by getting Susan fired (which at least left her starting a blog and very happy to be covering Ollie’s mayoral woes), just before Adrian comes in with his resignation, ready to take the fall for this cover-up. Ollie declines, which maybe he shouldn’t, as the City Council will be handling his impeachment hearing, and he’s not a favorite among those guys. Meantime, Curtis is making some spheres to use for crimefighting, so of course, Rene has to rib him about making a set of balls for the rest of the episode. Oh, and our dear ol’ Vigilante looks to be planning to put a few bullets into Mayor Ollie soon! No way I would travel anywhere in Star City at this point without an armed convoy. Even then, I would fear for my life. Tribunal. The first hearing presents a strong case against Ollie and the Green Arrow (played by Prometheus to kill Billy or not), so that’s not good. On the limo ride out of the hearing, Ollie, Thea, and Quentin (with Dinah as security) discuss how the hearing is going, and Thea makes a disturbing suggestion: use dead Billy as a scapegoat to tilt the hearings in their favor. Ollie shoots down the idea immediately, and then in a surprise, Vigilante shows up to shoot up their limo! 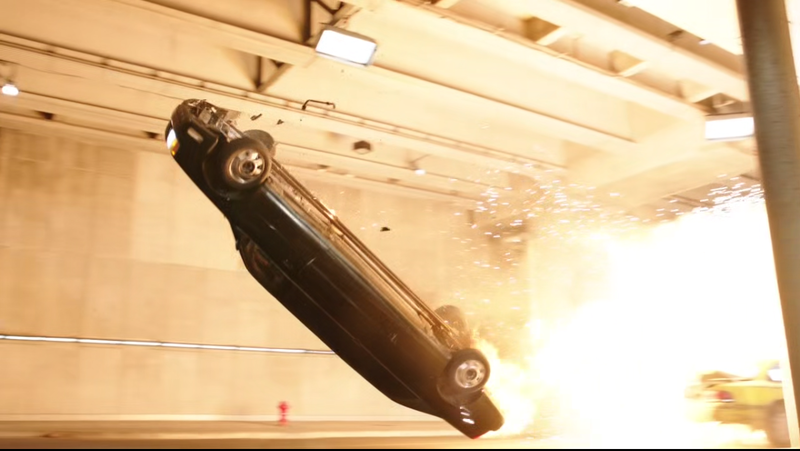 After a gnarly limo flip, Vigilante offers to spare the passengers if Ollie gives himself up. But Dinah blasts the dude with a Canary Cry, and after Ollie tries to lure Vigilante away, the cops show up and our gravely voiced ski goggle wearing psychopath escapes. Concussion. At the scene, Ollie is getting treated for a concussion as Adrian shows up to see what has happened (and isn’t it weird how he disappeared before Vigilante hit Ollie’s limo? A coincidence?). Ollie gets sent to the hospital to make sure he didn’t suffer any serious head trauma, and the rest of Team Arrow hits the streets to look for Vigilante. But Thea has a favor to ask of Felicity, which is to look into the past of the City Council (specifically those looking to bury Ollie) for some leverage. I think maybe enlisting the person who ratted on you last time to help you again is a bad idea, Thea. Also, Ollie, maybe not ask Felicity to deal with your current girlfriend’s troubles. Oh no! The slightly unstable District Attorney happens to be the extremely unstable Prometheus! Playing With Matches. The next day, Dinah arrives at the Precinct house and manages to get that Vigilante souvenir to take back to Arrow HQ. At the mayor’s office, Thea has another controversial solution to the impeachment hearing: blackmail one of Ollie’s biggest opponents, Councilman Kullens , by revealing the councilman’s hiding of his wife’s fatal car accident from being revealed as a suicide, which…DAMN, Thea. Ollie is even less (if you can believe that at this point) for dragging that out into the open. 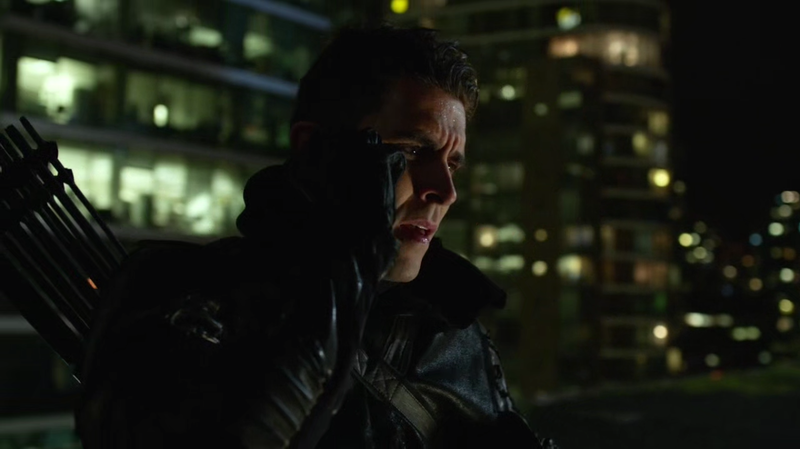 And of course, this news drizzles down to Arrow HQ, and Diggle just happens to mention that to Felicity. She eventually mentions the whole Helix thing (Pandora) that she’s been using and Diggle sees this a big problem for her, especially considering where she is mentally right now. And he may have a point, but while we wait on that, Curtis has a couple of big things happen. He gets a call from his estranged hubby to meet for dinner and those T-Spheres he’s been working on can be used to track Vigilante. And now, Ollie has a solution to the impeachment hearings that may work, but it requires throwing someone under the bus. Like who? Disavow. Outside the Mayor’s office, a press conference has been set up for Ollie, and the Team tracks Vigilante to…the building overlooking the Mayor’s office! 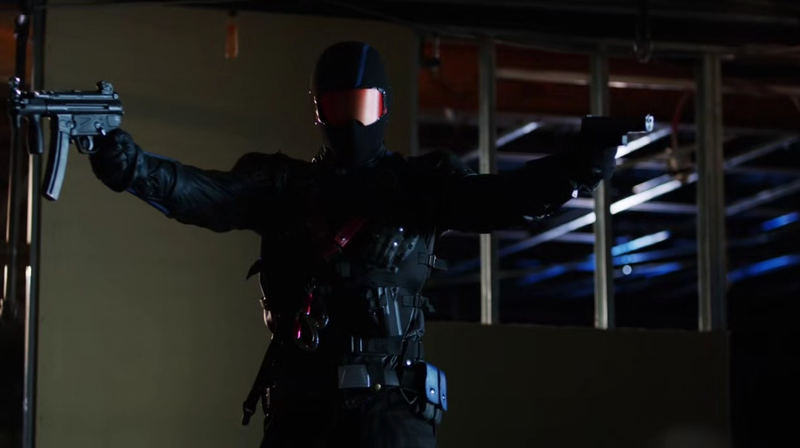 The Team does pretty well in preventing Vigilante from taking another shot at Ollie, even if it is to lose him again. And for Ollie, he says that he was convinced to lie by the Green Arrow to protect the hero, but now he believes the Green Arrow may have killed Billy, so he gives the SCPD permission to hunt him down as a criminal! Woo boy! And after this, Adrian is grateful for Ollie being a true friend. Oh, the backstabbery! When Ski Instructors Go Crazy. Next week on The CW. Separations. Thea decides that her behavior trying to protect Ollie has been as bad for her as it has been for him, so she decides to resign and get herself straightened out with an extended vacation. At HQ, Ollie talks about what he did, and says how proud he is of the Team, which he wasn’t sure of at the beginning. Well sure, one of them turned out to be a traitor and one has no more powers, but that’s a 50/50 split there. Felicity decides to truly settle in to Helix and join them, which clearly is not going to become a serious issue for her before the end of the season. And Curtis’ dinner date with his husband turns out to be his husband serving him divorce papers. Ow, dude. 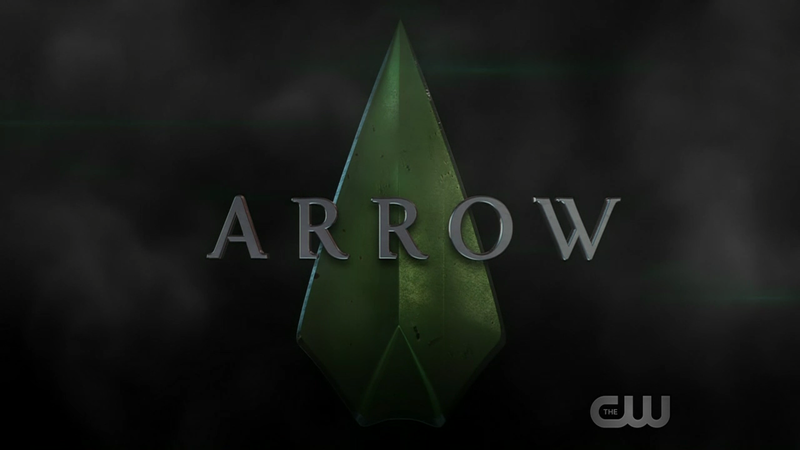 As for Susan, some “anonymous hacker” reveals destroying Susan’s rep, so she’s got her job back, and believe it or not, tells Ollie she’s completely cool with keeping his Green Arrow secret. I guess that relationship is gonna get patched over, or maybe not, because as she’s going to her car, Adrian shows up. And he’s got that “hey, Oliver Queen’s girlfriend, I got something I need your help with, like ending him” look on his face. –Comic book connections: Adrian Chase was actually the 80’s version of the Vigilante in the DCU, until he decided to kill himself to end the psychological torment of killing so many people. Long story there. –Just a reminder, one or two doctors at the hospital know Ollie is the Green Arrow. –So will that be it for Thea for the rest of the season? Well, I guess we’ll see, huh? –Do we think Adrian just left that evidence out for Dinah? He clearly needed it first to find Vigilante, but he’s still in the wind. –So clearly Vigilante is someone we don’t know, right?